Representatives Earl Blumenauer and John Conyers reintroduced the Saving America’s Pollinators Act, which would suspend the use of four of the most toxic neonicotinoids until the U.S. EPA conducts a full review of their safety. 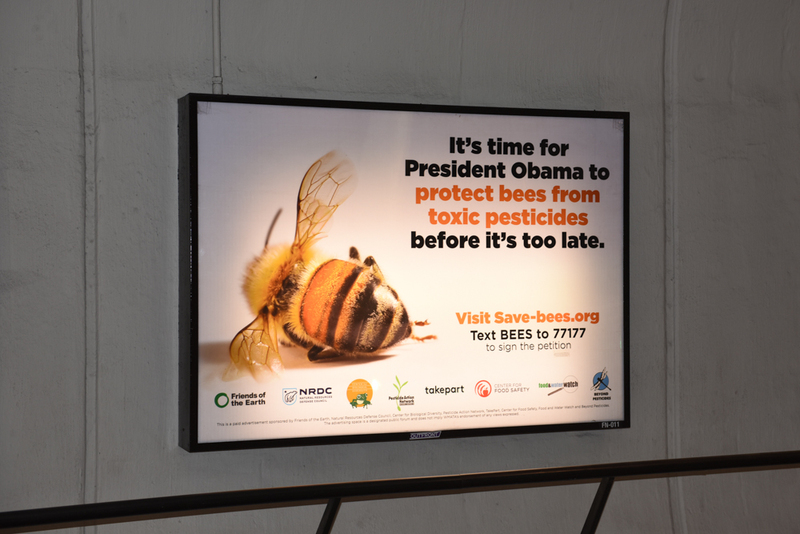 The rally coincided with both a D.C. metro ad campaign, and Representatives Earl Blumenauer (D-OR) and John Conyers’ (D-MI) reintroduction of the Saving America’s Pollinators Act, “which would suspend the use of four of the most toxic neonicotinoids until the Environmental Protection Agency conducts a full review of their safety,” said Friends of the Earth. Neonicotinoids are a class of pesticides that are known to have acute and chronic effects on honey bees and other pollinator species, and are considered a major factor in overall population declines. Twenty-nine independent scientists conducted a global review of 1,121 independent studies and found overwhelming evidence of pesticides linked to bee declines. Concerned citizens refuse to sit idly by as pollinator species plummet. The action today followed a letter on Monday drafted by the coalition urging President Obama and the U.S. Environmental Protection Agency (EPA) to “take swift and meaningful action to address the impacts of toxic pesticides on pollinator species.” While the European Union passed a two-year moratorium on three of the most widely used neonicotinoids, the U.S. government has done very little. President Obama announced the creation of the Pollinator Health Task Force this past June and recommendations are expected later this month. “Given the historic decline in the population of pollinators—bees, butterflies and birds—it is critical that the president and White House Task Force show forceful leadership in addressing all factors contributing to the crisis, with the suspension of neonicotinoid insecticides being a critically necessary action,” said Jay Feldman, executive director of Beyond Pesticides, who spoke at today’s rally. Advocates remain hopeful that the task force will take a strong stance, but they worry that federal agencies might do more of the same—voluntary farming management practices, insignificant pesticide label changes and weak state pollinator plans, according to Friends of the Earth. Given the EPA’s continued registration of pesticides that are known to be highly toxic to pollinators, there’s reason for concern. The four million signatures were collected by Avaaz, Beyond Pesticides, the Center for Biological Diversity, Center for Food Safety, CREDO, Earthjustice, Environment America, Food and Water Watch, Food Democracy Now!, Friends of the Earth U.S., Green America, MoveOn, Organic Consumers Association, Pesticide Action Network, Save Our Environment, TakePart and Toxic Free North Carolina.